I got this stamp set ''Oh happy day'' from Simon Says Stamp a while ago but didn't had the chance to use it. I stamped some feathers in gold and some are stamped with High Dive ink from Simon Says Stamp. To add a bit of interest I inked with the same High Dive my card and then added all the details. The banner I adhered with foam tape to have a bit of dimension. To finish up I added some Pretty Pink Posh sequins, and my card was ready! 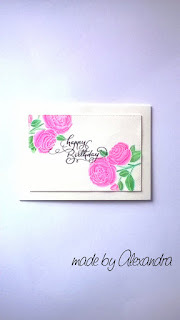 For this card I use Beautiful Day and Vintage flowers stamp sets both from Altenew and masking some of the flowers I tried to make a bouquet . 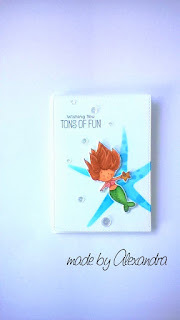 I stamped the images with Versa Mark ink and embossed with white WOW embossing powder and colored them with Stabilo Markers on watercolor paper! 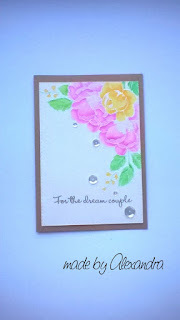 The sentiment is from Scrapberry's - To wonderful couple and I embossed with gold embossing powder from Simon Says Stamp! To finish up I added some Pretty Pink Posh sequins. Thank you so much for stopping by! Have a great day! 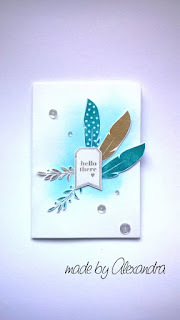 To create my background I used Simon Says Stamp inks : Lucky(green) , High Dive (blue ) and Teeny Bikini(pink) . The stencil for the clouds I made it from Lawn Fawn Cloudy Borders Die and just cut it from a piece of cardstock and inked with a sponge. I wanted the part of Heaven to have a different color and in my mind Heaven must have pink puffy clouds :) The sentiment is from the same stamp set and my critters are colored with Stabilo Markers on watercolor paper ! Thank you so much for stopping by! Have a lovely weekend! I am sharing today a card that I made creating my background! Lately I really enjoy black gold and white color combination so my idea was to create a gold dot background with a bold sentiment! 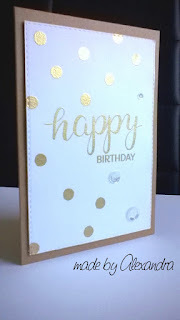 I used the sentiment from Create a smile - Happy Days which I embossed with Simon Says Stamp gold embossing powder. For the dots I used a stamp from Simon Says Stamp -Oh happy day .I was so happy with the result but I was so difficult to take the photo since was trick to capture the gold ! To finish up I added some Pretty Pink Posh and added some foam tape to my panel and adhered to a kraft card base. Thank you so much for stopping by ! Have a great day! Today I want to share with you a card that I made the other days , but didn't had chance to share earlier! 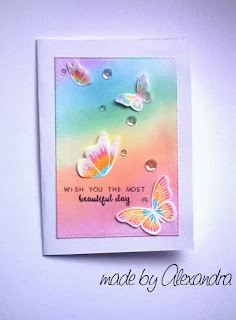 For this card I was inspired by the challenge from Virginia Lu which is ''All about colors''. 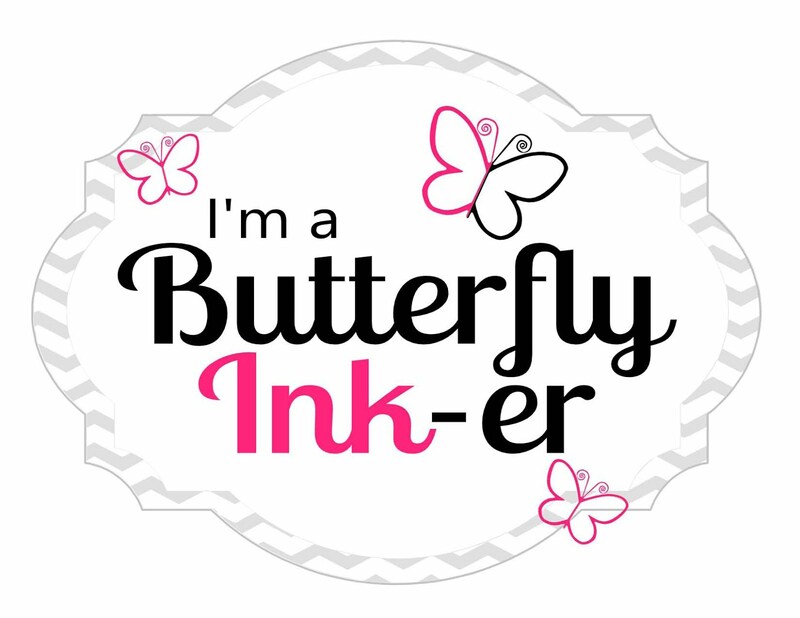 I am a big fan of watercoloring lately so my butterflies which are from Avery Elle - Butterflies are embossed with white embossing powder and colored on watercolor paper with Stabilo Markers. For the background I used Simon says stamp hybrid inks to created a rainbow effect. The sentiment is from Altenew -Beautiful day. To have a bit of dimension for the butterflies I added to their wings some foam tape. And to finish up I added some Pretty Pink Posh sequins . Thank you so much for stopping by! Have a great day! The critters are colored using Spectrum Noir Markers and the night sky is made using distress inks! I wanted to create a scene for my critters so I took the bench from Lawn Fawn - Winter in the Park and fussy cut to create the impression that my critters are in the park. The sentiment is from MFT - Snuggle Bunnies which I embossed with white embossing powder as well as the stars! Thank you for stopping by! Have a great day! 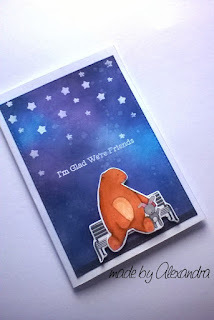 I made a card for the current challenge on Create a smile facebook group using stamps and dies from Create a smile and wanted to share with you . For the flower I used Crokisses stamp set which I inked with MFT hybrid -Black Licorice and stamped into watercolor paper and colored with Stabilo Markers. The tag I bought a while back and was already inked . The sentiment is also a die cut from Create a smile and I cut 2 of it and adhered together for a bit of dimension. To finish up I added some Pretty Pink Posh sequins. 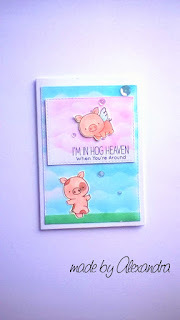 I finally got the chance to color my cute pigs from MFT - Hog Heaven and last night made a card with using also the sketch from MFT sketch challenge. I created the background using Distress Inks : Mermaid Lagoon , Picked Raspberry and Squeezed Lemonade. 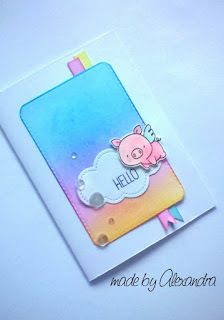 The little cloud I created from Lawn Fawn - Puffy Cloud Borders and the pig is colored with Stabilo Markers on watercolor paper. The sentiment is from the same stamp and to add a bit of dimension I adhered the pig with foam tape. Thank you so much for stopping by ! Have a great day! I wanted to stop by today to share with you a card that I made the other days! Many of you already know that since yesterday is started a new '' The daily marker 30 day ''challenge, so I am taking this as a great opportunity to practice coloring! Since I really love watercoloring I stamped the flower from Altenew Beautiful day on watercolor paper and then masking and adding the leafes! For my coloring I used Stabilo Markers! 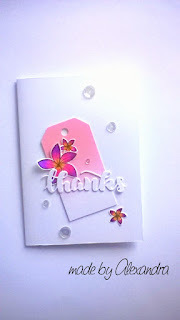 The sentiment is from the same stamp set which I embossed with WOW white embossing powder! To add a bit of dimension to my card I cut a frame from my panel and for the left panel I added foam tape, and then the frame I adhered flat to my card. Not so long ago I got my order from Simon Says Stamp and I got my very first Clearly Besotted stamp set - To you with love. I just love this flowers they are so easy to color . 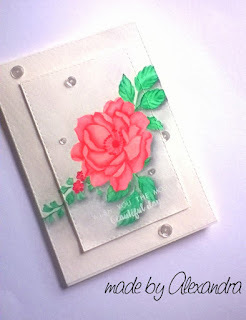 For my card today I used white embossing powder from WOW and colored my flowers with Stabilo Markers on watercolor paper. The sentiment is from the same stamp set. I wanted to keep my card very simple so I didn't added any sequins I just added some foam tape behind the panel to add a bit of dimension! Thank you for stopping by! Have a great day! 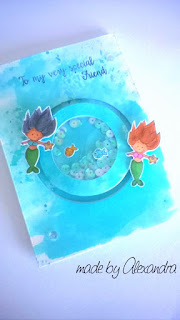 For this card I used a stencil from my stash and created the sea star with Distress inks : Salty Ocean and Mermaid Lagoon. The mermaid is colored with Spectrum Noir Markers and I added for the sea star glossy accents. The sentiment is from MFT Adorable Elephants and to finish up the card I added some sequins from Pretty Pink Posh! Thank you so much for stopping by! Have a great day! 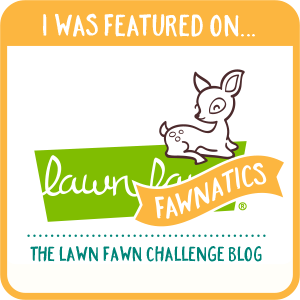 Challenges Gerda Steiner Designs - July Challenge Task for two Tuesday! - Summer Party!